Alright, this took me some more time than I thought it would. 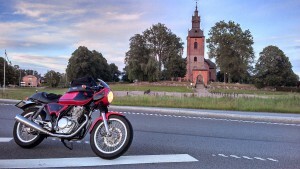 After I finished my first SS1000 “Runt Vättern” last year I was pretty decided to go ahead with LD riding. And I thought – living in Kiel – heading east for Gdansk in Poland would be a nice idea. 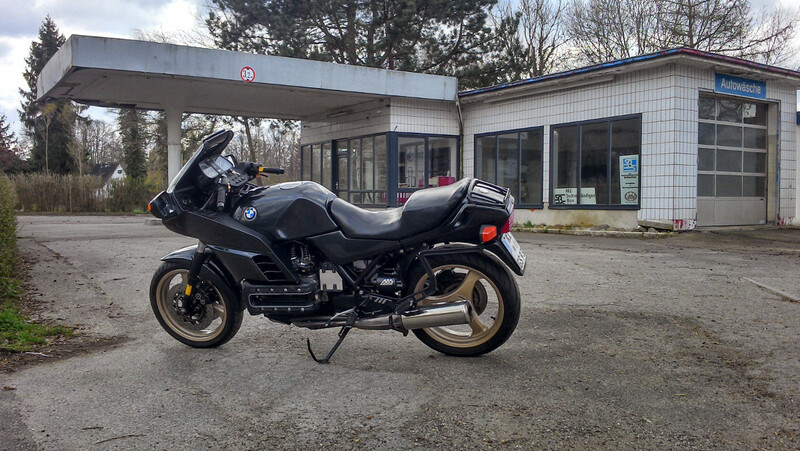 It is perfectly around 500 mls in distance and the freeway on the German part of the tour (A20) has always been more or less empty whenever I used it – should remind me of the depopulated country of Sweden in Midsommar night. That said, I have never been to Poland, it is high time to get to see the country neighboring to the east. She cannot be compared to any of the modern superbikes, but to me it is a big jump in terms of power, speed and road stability. It took me about six weeks and a lot of help by the mates and experts at www.flyingbrick.de to get her to shape. She is not perfect now but already has proven that she can take me long distances comfortably and fast. Now in the eastern part of the Gdansk area the is a small peninsular called “Westerplatte” that played a quite important role in the history of the 20th century. After WWI is was a part of the Free City of Danzig until the League of Nations, predecessor to the UN, decided to let the Polish Navy have a harbour there. The then German dominated political class in Danzig was not specifically happy about that. So Westerplatte was one of the major targets when German troops assaulted Poland in 1939 – marking the onset of WWII in Europe. Although the polish army eventually had to give up Westerplatte, the operation must be regarded a militarily disaster on the side of the attacking German army. Read here. Ever since Westerplatte is an national icon for Poland, and I like to see the place myself. As I am writing this, I will set sails in about two hours, approximately at 02:00, Saturday May 16. Got my start witness at the Flying Brick regulars’ table tonight, nice coincidence. It took me a while to sort my paperwork. Especially as my hand became increasingly unintelligible during the ride. Filling the forms, sorting the receipts and submitting this to IBA is not quite comparable to a tax declaration. It’s just more fun by far. The ride had not been simple and straight forward and I had to explain the situation for one of the receipts. So I had my fingers crossed until last week a nice thick envelop arrived. They’ve accepted the ride and awarded me with IBA membership (short reminder: you cannot talk or buy yourself into the IBA, you just have to ride LD). 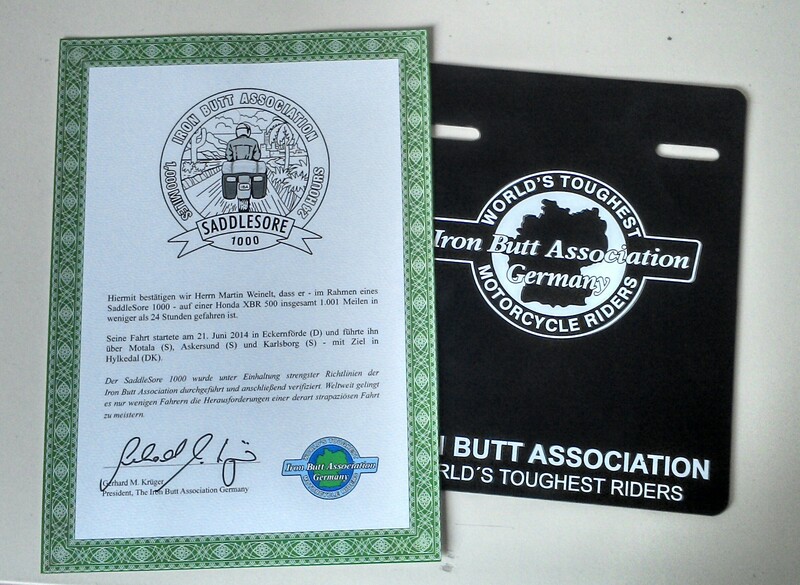 The IBA Germany President Gerhard M. Krüger stated in his very personal welcome letter, that I could use a bit more preparation with my next ride. That’s more than true for both: the bike and me. Btw, reading through rally annals, Gerhard seems to be the master of bonus points per mile, a sure sign of perfect preparation. I am already planning for another ss1000 which would take me to the east. And a Bun Burner 1500 next year. The XBR is just too happy leaving the county. This is on my first attempt doing long distance ride as specified by the IBA. 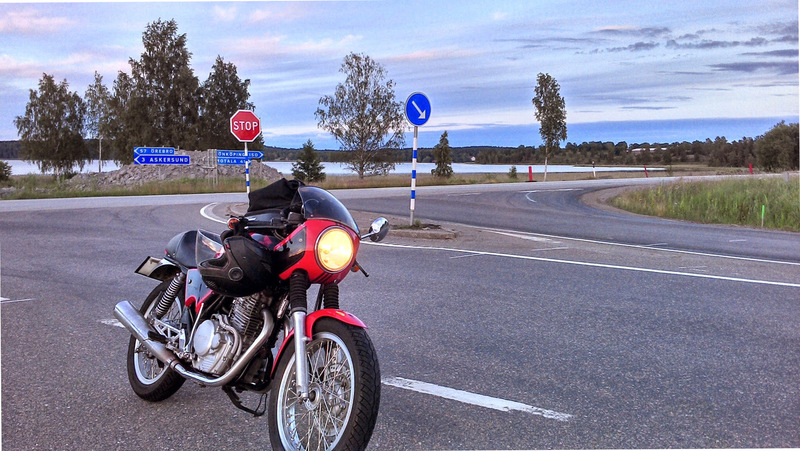 Read this post on my plans for the SaddleSore 1000 “Runt Vättern”. I had been watching the weather forecast on friday quite frequently. At one of my favorite sites, the Nowegian yr.no, they featured a nasty low pressure system located over Finnmark, emitting rings of rain cells that had to face very little resistance from the south. For the areas of Kiel, Copenhagen/Malmö and Lake Vättern/Askersund this translated into: I may see the sun from time to time, but I will definitely get wet regularly during the ride. And it will get chilly in the night, I was by no means decided to bite. Anyway, I went to the garage after work, put finishing touches on the bike and packed my things. I rode over to my wife’s place. I would start from there and she also agreed to be my witness. When I got to her house, my mood had considerably changed: the ride was planned, the bike was ready, “Midsommar” was lurking around the corner, what the heck am I waiting for? Girls throwing petals at me? The night was short and in contrast to my usual habit, I woke up around 6am. Decent coffee, preparing sandwiches and swearing to my wife I will not take any chances and if I get bored by the whole thing I might be back before noon. I dressed with the forecast in mind, quite unusual for the season: insulating underwear, the extra lining for the jackett and water-proof gaiters over the boots. I could hardly move. I had not filled up the tank on Friday, so my first stop would be a gas station in the town of Eckernförde, some 25 km away. This would get me the start receipt for the SS1000. The ride from Kiel around Lake Vättern and back amounts to nearly 1800km (~1100 miles), so that did not matter much. From there I took a state road to Schleswig, not heading straight to the Autobahn. As this was my first real LD ride and I had planned everything perfectly on paper, I was moving on with the comfortable illusion that I got plenty of time. I joined the Autobahn at Schleswig and yes, it was cloudy with occasional spray from above. 15 to 20 minutes of riding I was enchanted by the idea of becoming one of the “Worlds toughest Riders”, and was pretty sure, that I will not break off the ride. Just to see the hazard flashers turned on by parked cars on both lanes in front of me. Meaning: an accident had occurred, traffic jam – the highway is blocked. I sneaked through the central gap the cars had formed for ambulance and police cars, parked quite near the site and shut off the engine. A biker had lost control, and the motorcycle was laying on the lane, some bits spread over the place. I did not see the biker, but others told me, he was standing and walking about after the accident. That was good news. But sure enough, he had to see a hospital for a check, so the ambulance was expected to arrive and after a while it did. Then, for any oil or gas spilled in Germany the firefighters are called to take care. I never understood, why a single ambulance is sufficient to supply help to an injured person, but two fire engines and a crew coach are needed to throw a shovel of sand onto an oily spot on the street. 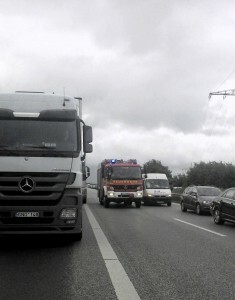 I guess I have seen all professional plus the voluntary firefighters from around Schleswig that morning. Now, I was expecting the road to be opened again very soon. But that was not the case: we had to wait for another official. 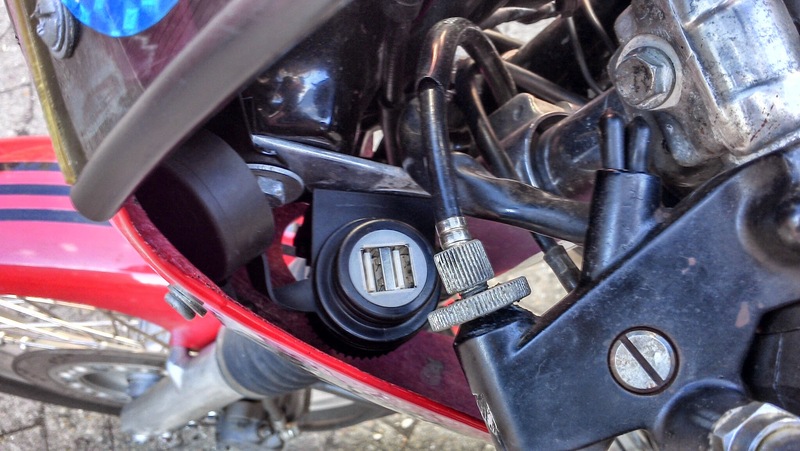 The police suspected there might have been something wrong with the bike that potentially beares legal aspects. What that would be, I only could speculate: design fault on the side of the manufacturer, or illegal modifications by the owner? So they called a state attorney for an audit. And this attorney does not live in or close to Schleswig, but had to be flown in from Kiel, the state capital. Not precisely flown in, he eventually arrived in a Volkswagen. You see: I got nervous. Fact is, the police are doing their professional job in taking care of these situations, organizing help to the injured and making sure the road is not blocked one single minute longer, than absolutely needed. But the prospect of me finishing my ride in time now was in jeopardy. I thought: “Get home, this is not your day.” But then, I already was in rally mode. After roughly 1.5 hrs, they opened one lane and I could move on. And made the biggest mistake of the entire ride: twist the handle trying make up for the lag. An experienced LD driver would have considered what actually happened, the options and consequently pulled over at the next gas station to collect a new starting receipt. I had just travelled some 100km in about three hours, a distance easy to cover during or at the end of the ride. But I had only one immediate goal, the Shell Vissenbjerg station at the E20 close before Odense. I guess the mantra of “Plan your ride, ride your plan.” is not always the optimal guidance. At Vissenbjerg station I was welcomed by sunny weather and bus loads of tourist. I was very satisfied by being there, refilled as planned and parked with ostentation in front of the service building. Then went in to buy coffee and typical Smørrebrød. Missed rød pølse, though. Back to the bike, found a bench close to it and made myself comfortable with the sandwiches. Rest room visit and back again, check my stuff and – bam – discovered the “Single Point of Failure”: the USB plug socket I had installed some weeks ago did not deliver any power to my smartphone anymore. The accumulator of the phone was exhausted. Meaning: no calls, no text messages to my dear, no photos, no routing, no updates to SpotWalla via BubblerGPS. If you are used to having a working smartphone at your command, this is quite a disturbing prospect. Sheepishly staring at the phone and trying to figure what to do now, I went back in with the normal recharger to let at least the lady know, that just the phone went flat and not me. Back to the bike and what was that??? No license plate??? Okay, slowly now. I went from and to the bike so many times now, I MUST have had noticed before, if the plate had fallen off on the road. I have to confess: I love the looks of the machine and I do look at it when approaching, including even the plate. Could it be that the plate had been ripped off during my phone call? Possibly by one of these obviously bored lads that had passed me and the bike a number of times and now sporting a fat grin on their faces? No, that would be unthinkable and against the law. It must have fallen off on the road. Back in the shop, asking for one of the takeaway boxes, better two. Folding the box, painting the registration number and sacrificing the transparent cover of the GMaps printouts. Such a sorry effort can be bolted to a bike under the eyes of a sympathetic Harley driver on his way to a meeting in Roskilde. Now I really had to get going. Spend more than 1.5 hours at Vissenbjerg station, when I planned between 20 and 30 minutes at a regular gas stop. Heading to Copenhagen/Malmö I had to cross that Storebælt and Öresund bridges with entertaining wind gusts ( … the weather) and toll stations – not so entertaining. Took the next fuel stop close to Malmö (had planned another one) went up to Helsingborg and managed to avoid the E4 branch-off to the west, found the branch to the east. The next gas stop at Ljungby. This time clever enough to first remove the tank for checking the wires of the USB socket and then fill up. Happily figured out the fuse was blown, bought a set of 10 new ones, realized the fuse was okay. Checked the connections: too bad, did a decent job when I installed the thingy. The crap was internally rotten. Charger, phone and me walking into the 7/eleven, to tell my wife I am okay. And off I went, passing a pair of fellow German riders that did not even return my salutation, probably pissed by missing the World Cup game against Ghana. And then, just through most of Jönköping, short before Huskvarna, the road touches Lake Vättern. Impossible for me to describe the sight, nor the feelings it provoked. Most clouds had also cleared from the sky, it was incredible. The E4 runs snugly with the coastline, partly in different levels for the two directions. This construction is celebrating nature, awesome. 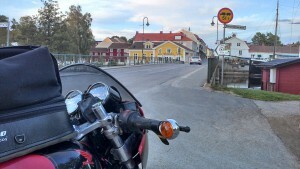 Another fuel stop (Östgötaporten), getting past Mjölby where the first “Askersund”-signes came up. Steady going and I entered the turning point of the ride at about 9pm. Askersund is a very nice little town with an impressive brick church. The gas station was staffed and the locals paid visits to it, buying sweets or coffee. Classic american full size cars from the fifties and sixties, low-riding, with matching rock’n roll music from inside. 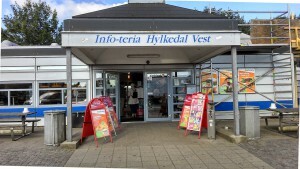 I spent around 30-40 minutes in Askersund, at the Shell station waiting for the phone to recharge, looking around, take some pictures, send the text message. At about 9:45 pm I took road #49 on the west side of the lake back south, back home. Remember: the tour was about: “Runt Vättern” (Round Lake Vättern). The road #49 is even more scenic than the highway on the eastern shore. It is made for motorcycle riding and with the night getting later, besides two or three trucks there was absolutely no one but me using it. Reaching Askersund I had already covered around 890 km (550 mls), so I figured it should be possible to ride the remaining distance in about 9.5 hours, if I stop fiddling with stuff and follow a straight schedule during gas stops. Apropos: in Germany you would fill up and then go into the building where you pay. Meaning: they often close the station during night, when sales do not cover for personnel costs. In Denmark and Sweden you use your CC directly at the pump. As no one but you is involved, you need not fear closed stations during night or weekends. 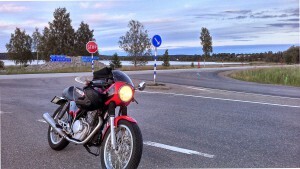 Passing through Karlsborg (obviously a traditional vacation spot), Hjo and Habo I reached Jönköping again. From there the toughest part of the ride began, as I saw clear skies only in the mirror and a black wall of clouds in front of me. From there on it was either raining or I was covered by the spray from the wet road. It was getting real cold. Half way between Jönköping and Värnamo I pulled over for a gas stop at Klevshult, barely able to unmount the bike. I wasn’t shivering – I was shaking. Stretching and bouncing I regained some life and went on, passing Helsingborg. Next stop at about 2:30 am in Glumslöv, not really feeling better. Exercising until the shaking ceased and back on the bike. I must admit, that I do not recall my ride around Malmö, the Öresund bridge and the 8km road construction at Copenhagen very well. What I do remember is entering the tunnel below Copenhagen airport because it was dry and warm down there. Short before Slagelse, I had gone about 170 km from Glumslöv, I was struck by a massive attack of fatigue. I had not felt any signs of being tired for the entire ride so far. But this showed all the classical indicators: unable to properly concentrate on the road and eyelids following their own agenda. No arguing, no internal discussions, I pulled over at the next rest area (Antvorskov Nord), parked, shut off the engine and sat on a bench, shaking gain. With an inner grin, I was happy that I was still in control and did the right thing. I stretched myself out on the bench to take a power nap. Don’t know how long I actually had been sleeping, but when I awoke I physically felt much better. To me the SaddleSore was over but I was very satisfied with having made the right decisions. I went on for the next gas station to fill up and find out what time it actually was. The pump at Slagelse Trafikcenter prints out: it’s 6:03am. Wait a minute, the odo tells me I need less than 140 km (87 mls) to make it to the 1000 miles plus some extra and I have exactly 1h 32’ left. Feeling fresh now this seemed to be doable on a early Sunday morning. On the bike I let go. I knew that my odo is quite correct, even a bit on the conservative side, so hurry up. South of Kolding the rest area of Hylkedal Vest was announced to come in 5 km. That would sum up to 141 km for this last leg. Rushed into the area, hopped off the bike, a quick look on the dashboard of a nearby car reveals: 07:27am. 6 minutes in time I proceed to the shop and lay my hand on the door handle. I stayed at Hylkedal Vest for about 1.5 hrs, enjoying the sun, the coffee and a working phone. Went back to my wife’s house really slowly and got there at about 10:30am. My dear was out hiking with a friend. She found me around noon, snoring on the couch. Considering a SaddleSore 1000 this weekend. 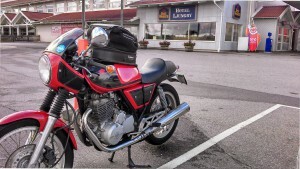 My planned route is starting in Kiel, passing Copenhagen, Malmö, ride around lake Vättern in Sweden and back home. “Roads leading to the coast or the county “Dalarna” tends to get heavily congested on Thursday afternoon, Friday morning and Saturday evening. The weather forecast isn’t very favorable with wet and chilly conditions. 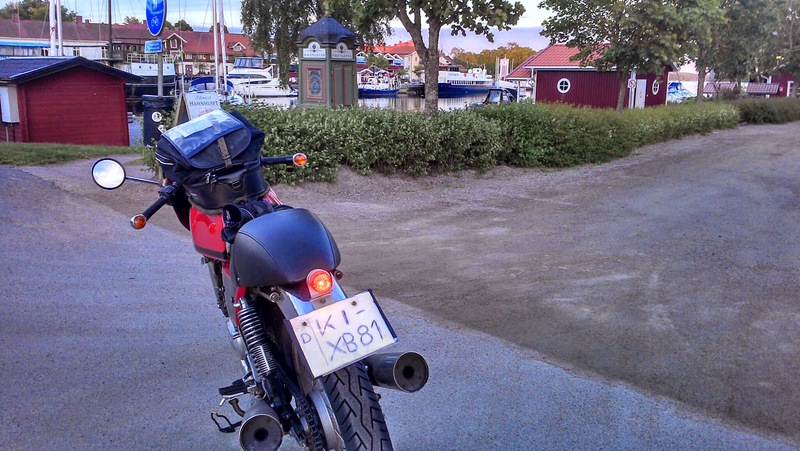 Riding the SS1000 during midsummers night has a specific appeal, but permanently getting soaked on my tour through Denmark and Sweden wouldn’t actually be the fun any ride should be.